Time to get a little science-y! To produce a permanent tattoo, the machine will push the needles into the dermis (the second layer of your skin) repeatedly at a quick speed. The needles hold and push the ink into the dermis as they penetrate the outer layers of skin. 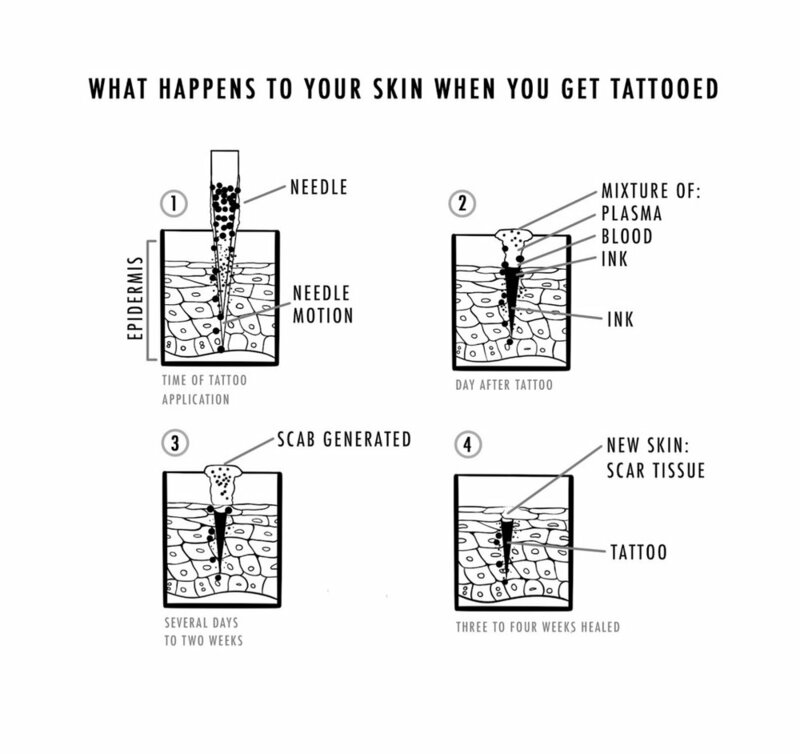 If ink only reaches the epidermis (the first layer of skin), the tattoo will not be permanent, as this layer of skin is continually shedding and replacing itself. Once pigment is placed in the skin, the body reacts by causing the area appear red, swell, and release blood plasma. This is caused by the continuous puncture and wounding of the skin caused by the tattoo needles. The body’s immune system causes increased blood flow to the area, as the body is trying to fight off infection. The blood cells are trying to protect the body from foreign ink particles, and as a result some of the pigment may be carried away through the lymphatic system, and eventually to the liver to be excreted from the body. However, your blood cells aren’t able to fully remove ink from the site of the tattoo, and as the body uses platelets to stop fluid loss and repair damaged tissue, a mesh is created. Much of the pigment will get trapped within the mesh that is created and become scabs or flakes, causing your new tattoo to peel. Remaining pigment particles too large to be removed by the blood cells will be captured by collagen and remain visible on your skin. Over the course of a week or two the body will be repairing the skin where the tattoo has been applied. This includes shedding off dead or dying layers of skin that the tattoo was placed beneath, and reparation of the skin that will contain the tattoo itself. The process of tattooing the skin is thought to interrupt the skin’s natural production of oils, which is why it is very important to moisturize the tattoo regularly. However, it is important not to over moisturize, as this will clog the pores, cause rashes or pimples, dissolve the delicate platelets and re-open the tattoo causing the oozing of more plasma which will result in more severe scabbing. We recommend trying to simply maintain a moisture level consistent with the parts of you that are not healing a tattoo! Once the newly healed tissue is ready, the scabs will begin to fall away, revealing a shiny, almost cellophane-like tissue beneath. This shiny skin will eventually return to normal, healthy looking skin after it has settled back into the natural process of exfoliation, which can take another week or so. When a tattoo is fully healed you will actually be looking at it through a layer of dead and dying skin that is not tattooed (otherwise you could scratch color off of a healed tattoo). It is this layer of dead and dying skin cells that make skin appear to have a matte finish.